What's the Difference Between Graphic and Game Design? Graphic Design vs Video Game Design? 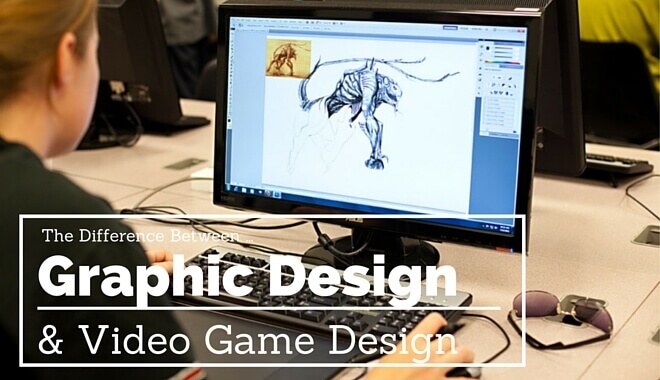 It may not seem obvious, but game design and graphic design are intrinsically linked. Graphic designers are an important part of the game design process, and often inform the work of game designers. However, there are some key differences between the two, and anyone looking for work in the games industry should understand them. Graphic design is all about the ‘visual brand’ of a product or company; that is, what people think of when they think about a certain game or studio. In terms of video games, this often relates to advertising and marketing, but can also relate to the design of in-game assets such as how text is displayed or how still images are used. There are lots of different ways one can be considered a game designer. Some game designers do more than one thing, and in small studios it is not uncommon for a game designer to do all of them! Game designers have a lot of say over the look and feel of a game, so it’s important that they consult graphic designers for the best way to go about this. The similarities between the roles both come down to the word ‘design’ – both are involved in the design of something, be it in-game levels or how an advertising campaign should look. Both have a lot of say in important design decisions for their field, and both can work on a games title to make it the best it can be. They work together, with one consulting the other, on how to make a game good and how to best present that game to the outside world. While a graphic designer might only be involved loosely in the development and deployment of a game, a game designer has a lot more say over how the game looks, feels, and plays. A graphic designer may be consulted for things like user interface design or how to display dialogue trees, but a game designer will have much more involvement in how a game is presented and how it plays. The difference really comes down to scope of involvement. A game designer is involved in every step of the design process, a graphic designer is much more specialized and involved in only those areas relevant to the graphic designer. If you are thinking of getting into the games industry, it is important that you consider your skill-set and exactly what you want to do in the industry. If you want to be involved with all the decisions that go into making a game, then it is probably best you focus your attentions on becoming a game designer. If you want to be involved, but feel your skills are much more visual, then perhaps focus on becoming a graphic designer with a specialization in games.